WILLEMSTAD - It is with great pleasure that we can announce an addition to the line-up of the Curaçao North Sea Jazz Festival 2018. The young musicians of The Roots of Music Marching Crusaders from New Orleans will perform on all days at the festival as ‘artist on the move’. The Roots of Music was founded in the aftermath of Hurricane Katrina and empowers the youth of New Orleans through music education, academic support, and mentorship while preserving and promoting the unique musical and cultural heritage of the city. The program, serving children ages 9-14, delivers over 2,500 hours annually of music history and theory as well as varied instrumental instruction and ensemble performance preparation. Instruments are made accessible by the foundation, which also provides the students with hot meals and round-trip transportation to reduce common barriers to participation. Each year it supplies over 30,400 nutritious hot meals, 1,400 bus journeys, and over 150 instruments for student use. 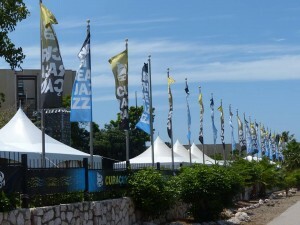 Thirteen talented students, entitled The Roots of Music Marching Crusaders, will let audiences experience the musical tradition of New Orleans during several performances at the Curaçao North Sea Jazz Festival.